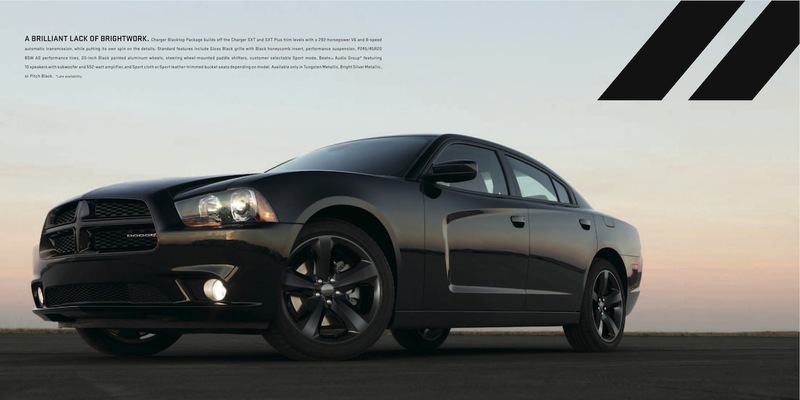 Sales brochure for the 2012 Dodge Charger. 2012 Charger models include the 292hp 3.6L V6 Charger SE; 292hp 3.6L V6 Charger SXT and SXT Plus; 370hp Hemi 5.7L V8 Charger R/T, R/T Plus, R/T Road & Track, and R/T Max, and the 470hp 5.4L Hemi V8 Charger SRT8. Exterior colors include Redline, Right Silver, Blackberry, Pitch Black, Tungsten, Bright White, and Blue Streak.